Tune in Tuesday is a weekly meme hosted by Ginger at GReads. And this? This is the best category EVER. My teen years. Note: not everything I listened to as a teen was current. I listened to a lot of 80s new wave and stuff you’d hear on First Wave on Sirius, plus a lot of 80s stuff. I’m not as old as you might believe based on some of these selections. Ahem. Today is a bit of a hodgepodge. Some alt stuff and some hip-hop. Crank by Catherine Wheel. Baby Jesus, the crush I had on this man…and he still looks good, tbh. Please link yours in the comments below and I’ll stalk your face! ETA: so that it can never be said I can’t make fun of myself, some pics of me as a teen. Note the big-but-not-quite hair. 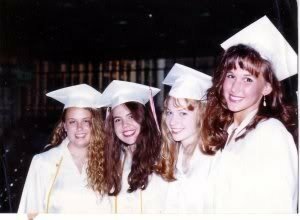 Fortunately I narrowly missed the giant hair phase in high school. Graduation. White did nothing for my figure or complexion. Tune in Tuesday is a weekly meme hosted by Ginger at GReads. And this? This is the best category EVER. My teen years. 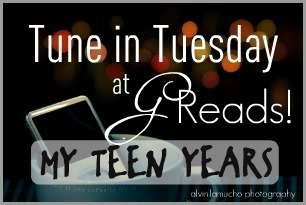 And today is very special because I’m doing a ladypeople edition of Teen Years Tune In Tuesday! Sorry gents, it’s all ladies all the time today. Vague disclaimer: not everything I listened to as a teen was current. I listened to a lot of 80s new wave and stuff you’d hear on First Wave on Sirius, plus a lot of 80s stuff. I’m not as old as you might believe based on some of these selections. Ahem. 32 Flavors by Ani DiFranco. A staple of the late 90s college experience. St. Theresa by Joan Osborne. One of Us ended up being her big song but this is her best song. IMO, anyway. Please link yours up in the comments below so I can creep on you the way God intended. Please link yours in the comments below! I’ll say up front that not everything I listened to as a teen was current. Even as a teen I was the musical equivalent of Hipster Kitty. I listened to a lot of 80s new wave and the like. So just a disclaimer…I’m not as old as you might believe based on some of these selections. Ahem. Friday I’m In Love by The Cure. There is nothing not awesome about The Cure. Creep by Radiohead. Not my favorite song of theirs (that would be Paranoid Android) or from my favorite album (OK Computer) but awesome nonetheless. Never Tear Us Apart by INXS. Still one of my favorite songs ever. Heartbreak Beat by Psychedelic Furs. I can’t hear this song without thinking about John Hughes movies. Valerie Loves Me by Material Issue. Love. 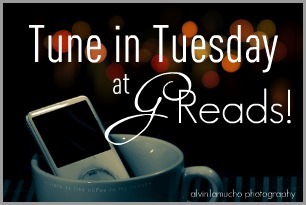 Tune In Tuesday is a music-ish meme hosted by Ginger at G Reads. Sharing is caring, especially when it comes to music. It’s a mellow music day here at Attack the Stacks!